The ASX 200 shed another 60-odd points on Tuesday, or 1% of its value. Energy stocks drove the market lower, and overnight, oil prices registered more big falls. Is this another sign of global growth peaking? But for the Aussie market, I think politics is driving prices lower right now. What is driving the Aussie market lower? That is, the market is in the process of pricing in a Labor government. This means things like more renewable energy investment, a potential end to franking credit rebates for retirees, and an end to negative gearing on existing homes. ‘Labor’s $32 bln plan to end negative gearing for existing homes and slash the capital gains discount would lead to a fall in new housing construction of up to 42,000 dwellings over five years and 32,000 fewer jobs across the country, according to independent modelling of Bill Shorten’s key property policies. ‘Warning of a significant contraction in housing supply, which could further strain the major capitals Sydney and Melbourne struggling to cope with population growth, the modelling forecasts a downturn in housing supply equivalent to accommodating 100,000 people. The Master Builders Australia would say that, wouldn’t they? What I’d like to know is how ending negative gearing for EXISTING homes will affect the supply of NEW homes, if negative gearing on NEW homes is still allowed? Gaining a tax break for investing in the existing housing stock doesn’t make sense. So Labor is right to try and remove that incentive, while still encouraging capital to flow into new housing. But the problem with Australia’s housing market isn’t just tax policies that drive prices up. It starts at the source where a small number of companies secure land releases and then drip feed the supply into the market to ensure land prices remain highly profitable. And if you want to take that a step further, it comes back to a lack of taxing power for state governments. Land and property is the one thing the states can sink their teeth into, and they give it everything they’ve got. 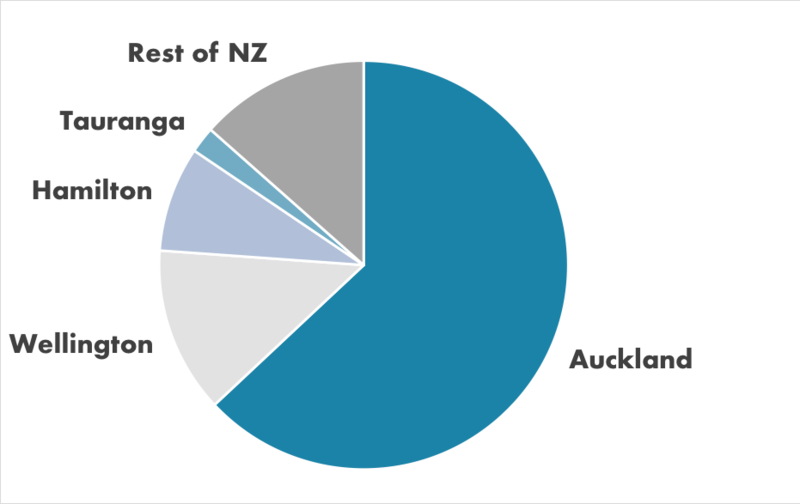 Apart from property and land taxes (and resource royalties) they mostly rely on the federal government’s distribution of GST revenues. States have become so reliant on these land and property related revenues that they are not able to lower them to, for example, incentivise inter-state migration. South Australia, for example, could waive stamp duty and see a big boost to population growth. But stamp duty, despite being a stupid and inefficient tax, is the golden goose of state governments. They’re not going to touch it. In the meantime, house prices in Australia will remain under pressure due to tighter bank credit and buyer nervousness. However, I’m not expecting a crash. Interest rates remain low at 1.5%. The way things are going, the RBA will be more likely to cut rates next year rather than raise them. Are we at the start of a bear market? And with the Aussie dollar down around 15% this year (against the US dollar), the purchasing power of many foreign currencies have increased. This makes Aussie asset prices even more appealing to foreign buyers. 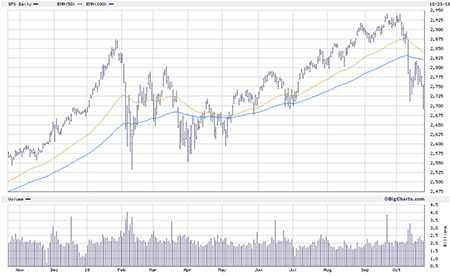 Heading back over to the US markets now, and you can see in the chart below the S&P 500 fell to a fresh low overnight. It found support at 2,700. 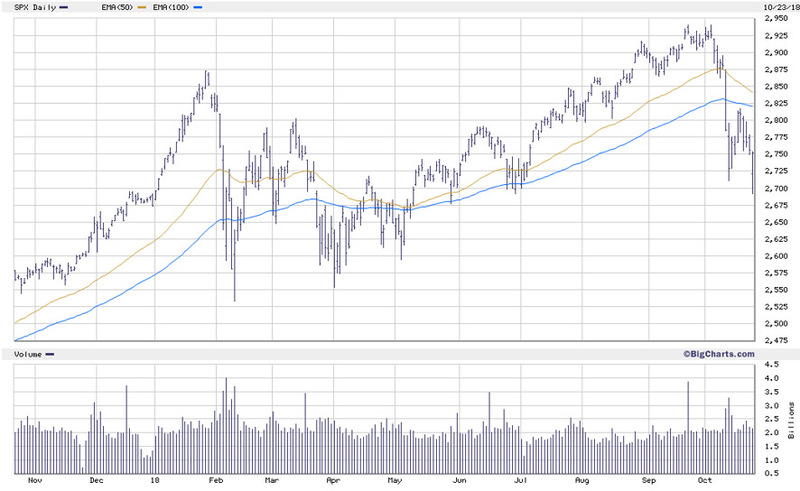 If this level cracks, it opens the market up to the lows from earlier in the year around 2,575. If these levels crack…the bear market will be in full force. The S&P 500 finished the session down 0.47%, after being down much lower at the start of trade. Weak earnings updates from large-caps Caterpillar and 3M didn’t go down well. This tells you that the market has priced in some pretty good earnings results and anything less than great will result in selling. If the earnings cycle has indeed peaked, then we could well be at the start of a decent bear market. That means falls of at least 20% from the peak. In Australia, a bear market looks likely too. The banks will struggle for some time, given their exposure to the housing market. And with China under pressure, the resources market could soon start to weigh on prices too. In short, it looks like the tide has turned. Both investor sentiment and the fundamentals appear to have shifted. While it might seem like a scary time, if you keep your head, this is when you can find some long-term bargains. But you need to be patient. Buying the banks now, for example, could prove to be too hasty. You’re better off waiting for signs that a bottom is in, and buying at higher levels, rather than trying to pick the bottom now or in the coming months. That goes for many other stocks that have fallen into their own bear markets this year. Be patient in your buying and set yourself up for the next bull run. Where Should You Look When Stock Prices Fall Lower?